Dial Archive | Dial | Exploding Yogurt Social Media And Brand Loyalty | One Lucky Guitar, Inc. I want to talk to you about yogurt. Yes, you heard (read?) me correctly. Yogurt. Do you eat it? Original, low fat, Greek? Do you care what kind you buy? I eat it near daily (even against my low-dairy recommended diet). It’s always been a staple—a lot of yogurt tubes when I was young, some whipped variations that I put in the freezer in my teens, and now, I’m all about the Greek. And I’m sure you’ve guessed it—not just any Greek yogurt. But we’re not really here to talk about my yogurt preferences…are we? Wait, yes we are! If you’re familiar with Chobani, you know that they make delicious yogurt. They’re my FAVE. And you’re probably even more so aware that they just reinvented their visual identity in order to distinguish themselves amongst their competitors, who all have a similar look. But that’s not what I really want to talk about (although I AM a fan of their new look). I want to talk about their brand. Chobani’s visual identity is just one vehicle that carries their brand. The thing about brands is that they’re kind of ubiquitous. A brand manifests in infinite ways—visually, in marketing channels, through customer service, in a physical space, in face-to-face conversations and so on. It’s how your audience perceives the touches you make with them. We’re pretty fond of Marty Neumeier here in the office, and it’s like he said—A brand isn’t what you say it is. It’s what they say it is. In the very late summer, nearly fall, of 2013, I grudgingly woke up at 7 AM five times a week and slipped on my running shoes (Yes, in that order—I slept in my running clothes, okay? Anything to make those horrible things called “mornings” easier). I was training for my first half marathon, the Fort4Fitness, and all those blogs and running magazines stressed a good breakfast, like I haven’t heard that every day of my life without the additional stress of a race, whatever. So each of those mornings, I fueled my run with Chobani. I had running buddies who touted Greek yogurt for its protein, and recommended Chobani for its taste. I agreed, and it became my favorite breakfast. You can imagine how surprised I was to, one morning, get on Facebook and read about people’s illnesses and bloating cups. Apparently, all of the cups made at the Idaho plant grew some real nice mold, and some people had cups that entirely exploded. Yeesh, right?! I panicked. Would there be yogurt all over the inside of my fridge downstairs? Would I be sick from yesterday’s breakfast, even 24 hours later? Hysteria! Luckily, I didn’t have any yogurt from the infected batch, although I did toss all of mine. And even though my fridge wasn’t graced with any explosive decoration, I did feel personally affected by the whole situation. I felt my trust fall near flat—how could this yogurt that I allowed into my daily routine fudge up so badly? Why would I buy this again? • They immediately worked to remove the affected batches of yogurt. • They immediately ceased posting all content that didn’t directly address their product issue. • Their CEO became the face of the issue, making more human appeals and meaningful responses. • They responded to everyone, and I mean everyone. Leave no tweet untouched, no mention unaddressed. • They were transparent. They gave their customers directions to address the issue—with Chobani and the FDA. • They apologized. They refunded. They explained. They apologized, some more. • They were sorry, and they meant it. And they were relentless in letting you know they did. Wow, right? And that, my friends, is why I love Chobani. I was going to say “Maybe it’s just me,” but that’s not true, since they hold 40% of the Greek yogurt market. I think they’ve earned our trust back (hell, they worked for it). 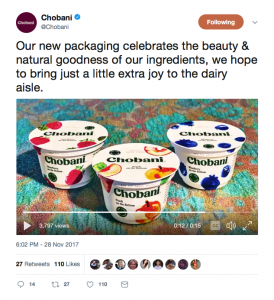 By no means was this situation a favorable one, but the way Chobani handled it was that and more. So many people have taken a look at this case, and called it a social media win. But really, this is a brand win. Their commitment to compassion, hard work and honesty shined, like a polished trophy, even in the most unfortunate situation. That’s the thing about a brand—it lives on through the good and the bad, the logo and the crises. Our goal as marketers is to create work that accurately reflects the mission, vision and values of an organization—whether that be through a logo, communications, ads, social media, events, customer service and so on. You know, wherever brand soul comes to life. PS—Do you love this video as much as I do?